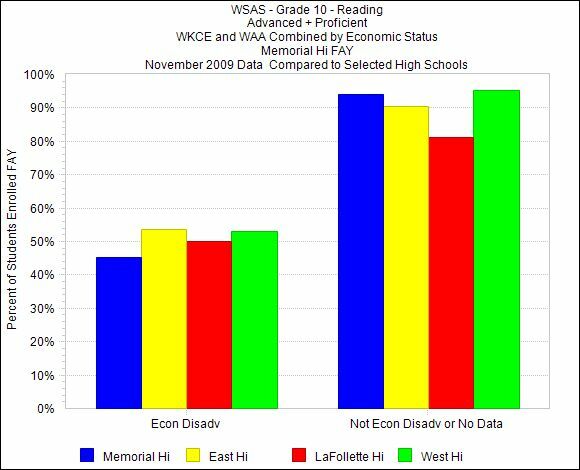 Note: For a while, I’m going to be illustrating the “On the Agenda” posts with various graphs documenting achievement gaps in MMSD as revealed by the admittedly flawed and limited WSAS/WKCE results. I think regular reminders may do some good. For the Madison Metropolitan School District Board of Education and related bodies, hree meetings on Monday this week, one on Tuesday. The Four-Year-Old Kindergarten Advisory Council continues their work at 9:00 on Monday, at the 4C offices. The new Board Ad-Hoc Committee on Equity and Decision-Making will hold their first meeting at 5:00 PM in the Doyle Bldg, Rm 103. The agenda revolves around committee goals. There will be public appearances and if you have concerns about equity related things, I’d suggest getting their attention near the start of their work. These could include anything from staffing, to class-size, to achievement gaps, to budgets, to curricula, to… for an idea of what the scope of this committee includes, check the Equity Policy and the work of Equity Task Force (as well as the Equity Report from earlier this year). One new thing before the Committee is an update on equity work. This partially updates the appendices of the rejected March version of the report, which linked district initiatives to portions of the Strategic Plan and Equity Task Force recommendations. I thought this was the best part of the March version, but it didn’t make it into the final. Good to see it back. What isn’t good is how much remains to be done. This will be followed by the full Board meeting at 6:00 PM in the Doyle Bdg Auditorium. There are public appearances scheduled and it can be assumed that both this meeting and the Equity meeting will be carried on MMSD-TV. A note to people not familiar with Board procedures, all public testimony is at the start of the meeting and you have to register by the time they begin. I’m not going to do the whole agenda this week, but just hit the highlights in approximate order of interest. The biggest item for most is the recommendation on the extension of TID 32 to fund the Edgewater project. Board Members Ed Hughes and Lucy Mathiak have both posted on this, and I put something on Forward Lookout. Some time ago I laid out why I thought this was a bad idea and in their memo to the Board the administration agrees with that conclusion (if not all the particulars), saying the extension will have a ““significant negative effect…upon our district.” Following their own paths, Hughes and Mathiak come to the same conclusion. Among the news here is anticipated decrease of $442,501 in state Special Education Categorical aids, and an anticipated increase of $1,569, 546 in state equalization aid from the amounts budgeted in the Spring. Unfortunately the increase in equalization is related to a decrease in property values, meaning that although the total levy will be smaller, the base for that levy is smaller also and the increased equalization only partially covers the difference (Penny for Kids is needed!). There are lots of moving pieces locally — including property values in the district — and statewide that contribute to these adjustments. One of the biggest pieces is the “Third Friday” student count certification. If we are lucky, that number will be previewed at the meeting Monday. None of this is final till the end of October when the tax levy is passed. 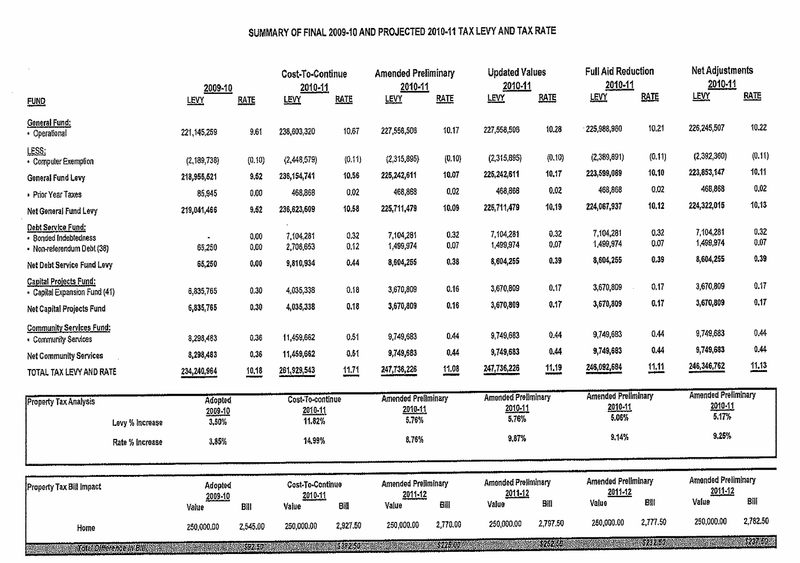 On a related and positive note, the district did save $185,954 in short term borrowing costs. These are combined here in a projected tax levy scenarios I think the last is the most likely. I don’t like the $250,00 “average home” calculations, but the levy increase expressed in that way is $237.50, or $12.50 more than projected in the Spring ((Penny for Kids! Now more than ever). And then there is the fund balance. It increased by $5.1 million in 2009-10. MMSD needs to have an open and thorough discussion of fund balance policies and practices (I’ve said this before). In the last three years the fund balance has increased by about $20 million, almost doubling. This is good and bad, but what is all bad is that it has happened without the Board directly addressing the choices being made. This money was collected to educate the children of our district and we (the people it was collected from) deserve to know if building equity at this level is the way it can best be used in the service of education. Last in the update is “Budget Tracking Table” with big and unexplained changes in the ARRA lines (these may be covered in this previous ARRA update. Nothing on the EduJobs money (my guess is that it will be used for 2011-12 in MMSD). Next in order of import is the Revised Code of Conduct. It looks like this might finally get done. I haven’t followed all the details, but I do like the Phoenix/Abeyance model as an alternative to expulsions. It is kind of insider stuff, but I find the the evolution of the Superintendent’/Board of Education Communication Plan fascinating. This is a new iteration and with each version it seems to get more detailed and more exacting. I applaud the effort to clarify roles and expectations, but find it disconcerting that all concerned feel it needs to be spelled out this thoroughly. To me that indicates trust, faith and yes “communication” are not where they should be. Maybe I’m reading too much into this; maybe I’m just more comfortable with improvisational give-and-take. Last item I’m going to cover (and the last item on the agenda) is the Legislative Liaison Report. Three things here. Next is Superintendent Tony Evers State of Education address. The big news here is no news on the Fair Funding Framework. For logistical and other reasons, there will be no further details till after the November elections. I’ll leave the “other” alone and note that there will be updated numbers to work with after October 15 aid certifications and the logistical reasons have legitimacy. Last is a Penny for Kids update. Not 100% sure what this will be, but I will take this opportunity to put on my Wisconsin Alliance for Excellent Schools Board member hat and thank MMSD for actively supporting this campaign. Much more on this agenda, technology purchases, big donations, contracts, Board/Common Council Liaison meeting …check for yourself to see what I missed. One more meeting. Ad-Hoc Hiring and Diversity on Tuesday, noon, at JC Wright Middle School. Another goal setting agenda and no linked documents. For some background see this report from September 2009. Staff diversity at all levels remains an issue. I hope that those working and agitating on minority teacher matters realize that this is a national problem and that long term solutions involving improving minority education, higher education opportunities, early recruitment into education fields and supports to achieve professional status are where the real solutions to teaching staff diversity lay. The district’s efforts can and should be improved in the short term (and not just with teachers, the clerical staff numbers are a disgrace), but only very limited improvements should be expected in the diversity of MMSD teaching staff. To make clear when Board of Education meetings will be telecast MMSD-TV will post a notification on the screen on Channel 993/96 on the day of the meeting. A notification will also be posted on the http://www.mmsd.tv homepage. Thank you. I wasn’t aware that when Room 103 meetings precede Auditorium meetings they aren’t covered by MMSD-TV. Good to know. In general, as I’m sure you hear from other, MMSD-TV does a great job covering meetings and distillate activities. It is much appreciated, I especially like the short videos highlighting programs being used to introduce Board Meeting.